Japanese industrial production dropped sharply in January 2018, Japan’s Ministry of Economy, Trade, and Industry reported last month. Seasonally-adjusted, the IP index fell 6.8% month-over-month from December 2017. Since the country has very little mining sector to speak of, and Japan’s IP doesn’t include utility output, this was entirely manufacturing in nature (99.79% of the IP index is derived from the manufacturing sector). Various reasons were given for the decline, as they always are, but more importantly it placed a great deal of importance on the February estimate. Was January a one-time aberration, or is there a looming break in trend? The Ministry released estimates late last week that suggest the break might be more than a one-month transitory anomaly. Industrial Production rebounded in February, but only by 4.1%. That left the year-over-year change (not seasonally-adjusted) as +1.4%. It’s the lowest gain since October 2016, down substantially from what increasingly looks like a mid-2017 peak (+6.5%). Like so many other economic accounts around the world, Japan’s IP statistic is often misunderstood or disingenuously deployed to sound off on the prospects of a turning point for Japan’s economy. It was that way at the beginning of Abenomics in late 2012, when IP turned positive then, too. 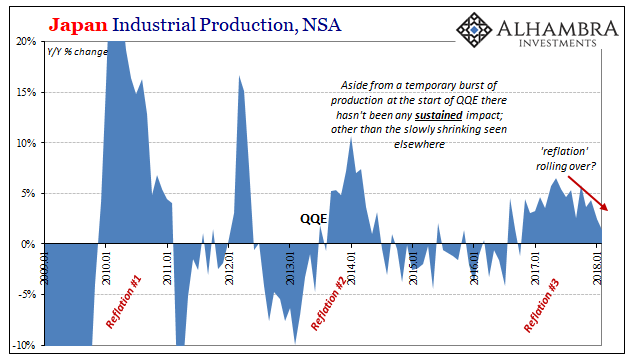 Between November 2012 (when the yen first started to fall) and January 2014, a period including the launch of QQE, Industrial Production rose 10.5% in those fourteen months. Over the prior thirteen months, dating back to October 2011, IP had contracted by almost 8%. The change in sign was widely hailed as strong evidence that Abenomics was working, and that ultimately it would prove decisive in Japan’s quarter century struggle with its economy. If a weaker yen could so aggressively restart Japan Inc, what couldn’t the BoJ accomplish given enough time? But by focusing on the plus signs, the degree of Japan’s difficulties was understated if not completely set aside. Even at its peak in early 2014, Industrial Production was still 12% less than it was in February 2008. That 10.5% gain during QQE and early Abenomics wasn’t really all that significant, and in the wider historical context never really appeared to be. Rather than learn from what is a clear repetition in pattern, these mistaken impressions and interpretations were repeated once more in 2016. 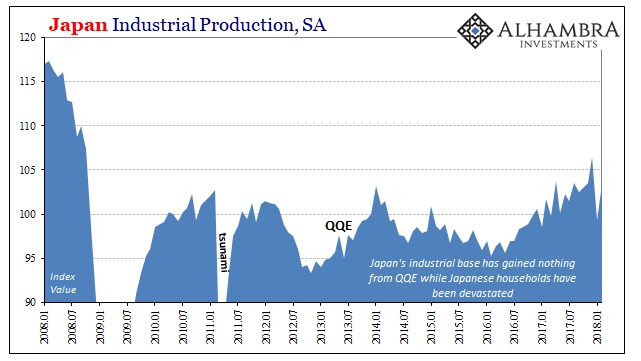 QQE and Abenomics had worked, so it was claimed, it just took a couple of additional years for the results to show. Between January 2014 and May 2016, IP dropped another 7.4%. It was easily blamed on the VAT tax in increase in April 2014, though no one ever explains why those negative pressures would take almost two and a half years to be worked through. Since that time, it is again up now 8% through February 2018 and the media celebrates how BoJ will like other central banks soon be talking rate hikes and exits. The mere appearance of positive numbers is in this convention sufficient proof for efficacy no matter how much time may be involved in either direction. A more conditioned analysis, however, would note the timing of each inflection: middle 2016 to current = Reflation #3; late 2012 to middle 2014 = Reflation #2. There was, as everywhere else in the world, a similarly proportioned rebound up until 2011 (interrupted by the catastrophic earthquake and then the monetary destruction later that year). In other words, for almost all of Japan’s post-crisis experience its IP statistic is contracting. The positives are far fewer than the negatives. They correspond easily with these obvious “reflation” episodes we find all over the world created by the abatement of destructive eurodollar impulses unleashed in intermittent fashion (nothing goes in a straight line). It also represents global economic shrinking and how this has been mischaracterized repeatedly over the last decade. There is no growth trajectory indicated anywhere in the industrial figures, an important description of the global economy rather than just Japan’s experience with its own “deflationary mindset.” Throughout all of it, IP swings from positive to negative and back again without ever moving out of that position; despite the passage of so much time even at these occasional peaks IP is always considerably below the prior 2008 peak. Yet, despite three almost complete swings since then, every time it turns positive it is paraded around the world as irrefutable proof the Bank of Japan, therefore QQE, therefore technocratic central banking, is a complete and total success. The problem with that is not mere interpretation. These mistaken impressions, often offered intentionally, greatly diminish the urgency to actually do something about the greater economic problem (while at the same time clouding the economic situation in the first place). And that problem is the Bank of Japan; Japan hasn’t spent the last three decades struggling with its economy so much as trying to deal with an over-aggressive central bank that is actually powerless to fix the problem (as they understand it). We can relate. This is how Japan’s single Lost Decade has turned to three, and how what was once believed to be a Japanese coincidence has become a global one (with the global economy working on its second lost decade). An upturn is not unexpected, nor is it a recovery. The world desperately needs the latter, having experienced (three times) only the former. Japanese Industrial Production may be the best example of all of it.